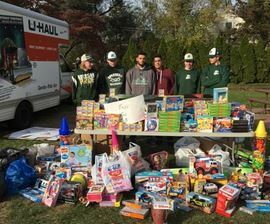 As you know the SJMSBL runs a Toys For Tots/Holiday Food Drive and this past Saturday 11/11/2017 was our 4th annual. This has become a big part of our league. We coordinate this drive with a kid’s pick-up game at the local Little league complex where we hold the drive. This year we invited the North Camden Little League to participate. As you recall this is the organization that we run the equipment drive for each year. This complex we play at is beautiful and I am happy to say that I was the V.P. of this complex for 16 years and myself and many others turned it into this beautiful place it is. Anyway what an overwhelming success the day was. We usually fill a van with food, this year there were so many donations I had to rent a 16’ UHaul cube truck and it was packed front to back, top to bottom. The toy collection was incredible as well and they are still coming in today. I had the help of my High School team throughout the day so they also got a chance to learn about giving back. Thank you for giving me the opportunity to be part of the MSBL, using our local SJMSBL league to do things like this and give back means the world to me. Hope you have enjoyed the tournament season was thinking about the nice weather yesterday morning while I was setting up for this event when it was 30 degrees. But I would not have changed anything for a second. I have attached some pictures for you just to see the scale of things. Again thanks and you and your family enjoy the upcoming holidays!